We are pleased to announce our new line of suiting fabric. This line is all 100% wool and perfect for suits, jackets, trousers and tailored dresses. 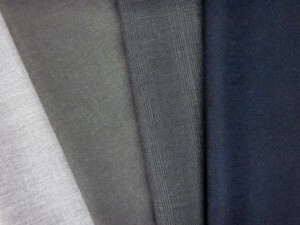 Colors shown in photo above; light grey, charcoal, grey plaid and navy. Also available in brown.